﻿ Incoming University of Florida president J. Wayne Reitz, outgoing interim president John Allen, and office staff in president's office in Tigert Hall. Incoming University of Florida president J. Wayne Reitz, outgoing interim president John Allen, and office staff in president's office in Tigert Hall. New University of Florida President J. Wayne Reitz, interim president John Allen, and office staff in president's office in Tigert Hall. 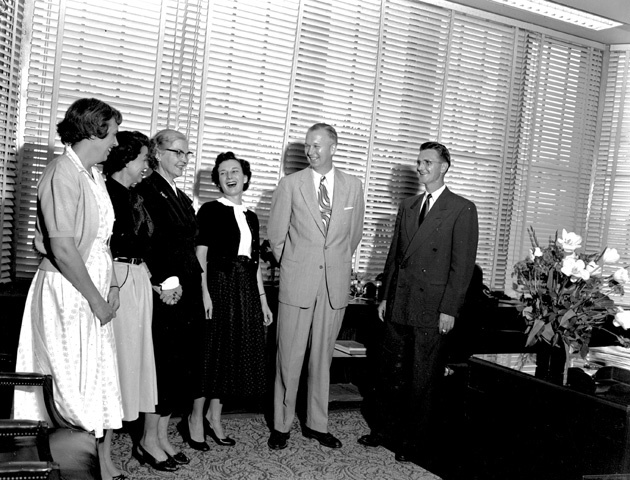 Reitz, Allen, and office staff in president's office. Photograph 4295 from the University Archives Photograph Collection.